Jamie Spence is refusing to give up on his dream of fighting for a major title as he prepares to get busy again this year. The experienced campaigner will lace on the gloves in his hometown of Northampton at the Deco on Friday March 9. ‘Mr Excitement’ has boxed on television before, most notably in a 2012 lightweight Prizefighter when he took a bloodied Derry Mathews the distance before losing on points. But a top title has so far eluded him, something he’s looking to address ahead of his 20th pro contest, with 15 wins and two stoppages to show for it. He once lifted a British Masters super lightweight belt with a points win over the most experienced fighter in the country, Kristian Laight, and has pursued bigger things ever since. His other defeats, all by TKO, came against powerful opposition in Karl Place and Lee Purdy, after a setback on his debut way back in 2006 against Gavin Tait. Spence is now up at welterweight and still craves his big opportunity, with a third straight run out at the Deco to negotiate first. “I’m playing it by ear, but I came into this sport to win a major title all of those years ago and that’s still my goal. “I always wanted to become a British champion, like most fighters, but it’s getting to the point where I’m open to anything.“I don’t know how much longer I’ve got left in the ring, I’ve had injuries and niggles and no one can carry on forever. “I’ve got a decent record, a lot of experience and, as long as I get the right amount of notice, I’ll give anyone a run for their money. “I’m older and wiser, I want to achieve what I can and I’ve been 10 rounds before, so I know can do the title distance. “It’s great to be boxing in Northampton and I’d love to have my next big fight there, but I’ll go wherever to get that opportunity. 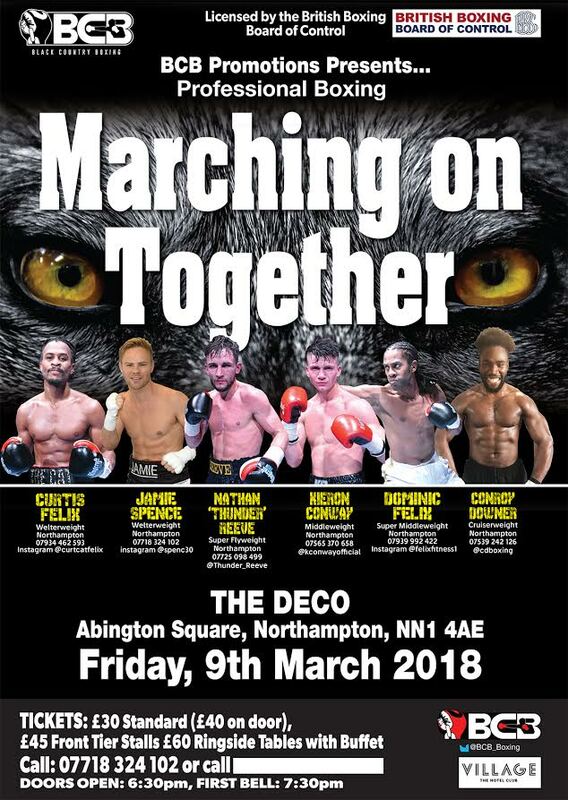 Four other boxers from Northampton are also in action at the Deco – Curtis Felix, Nathan Reeve, Kieron Conway and Conroy Downer. Tickets are on sale, priced at £35 for standard entry, which will be £40 on the door. Seats in the front tier stalls are £45, with ringside £60 including a buffet.For more information and to buy, call 07718 324 102. The Deco doors will open at 6.30pm on the day of the show, with the first bell at 7.30pm.